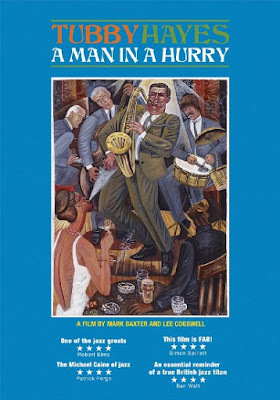 This excellent film by Mark Baxter and Lee Cogswell fills out the Tubby Hayes story with interviews and period TV footage, plus some hidden gems, helping us to take a closer look at a crucial period for British jazz. The basic story is now familiar: Tubby was a tenor sax prodigy, a professional musician at 15, running his own bands soon after, totally fluent soloing talent, arranger, played alongside Ronnie Scott in the two-tenors Jazz Couriers in the late 50s/early 60s, took up vibes and flute with ease and dexterity, got hooked on heroin, died in 1973 at the age of 38. This beautifully made film helps us to get to know more about both Tubby himself and the period in which he both waxed and waned. And what a story it is. For just under an hour we are immersed in the sharp-suited world of Soho in the mid-20th century, with some characters who were there and with others who have become obsessed with the appealing vibe, swinging soundtrack and the shadier side of life on the road. Narrated by Sherlock star Martin Freeman, the film presents a broadly chronological view of Tubby's life and career. We hear from his contemporaries including Spike Wells, Michael Horowitz, Peter Blake and devotees including Ray Gelato, Robert Elms, Eddie Piller and Simon Spillett, whose detailed biography of Tubby entitled The Long Shadow of the Little Giant was published last year (link to book review below). There isn't much in the archive of Tubby speaking, and what we hear is a few short clips from interviews. There are, however, many extracts from TV shows from the period featuring Hayes leading a big band from the front, eyes closed, leaning back, notes pouring from his tenor. It would have been lovely to see more of these on the DVD but many are available on Youtube. Tubby was also a regular in B-movies of the period, and we see some wonderful moments including Hayes and Roy Castle blasting some Afro-bebop in Dr Terror's House of Horrors. There is also a hilarious brief clip from the 1962 movie All Night Long where Tubby bursts into a jazz party hosted by Richard Attenborough who then hails Charles Mingus (the real one) as Chas! The film charts Tubby Hayes' sad demise, his huge energy and 'burning every candle in sight at both ends' to quote Ronnie Scott, together with a lifetime of drink and soft drugs and a sustained dalliance with heroin were too much for his heart. The end is handled beautifully, bringing a tear to the eye. And, of course we still have his albums, his TV appearances, his endless streams of classy hard bop tenor, soulful flute and romping vibes to revisit and enjoy. I only wished the film was longer, to spend more time with this irrepressible figure ; he was a true giant, and he was one of ours.